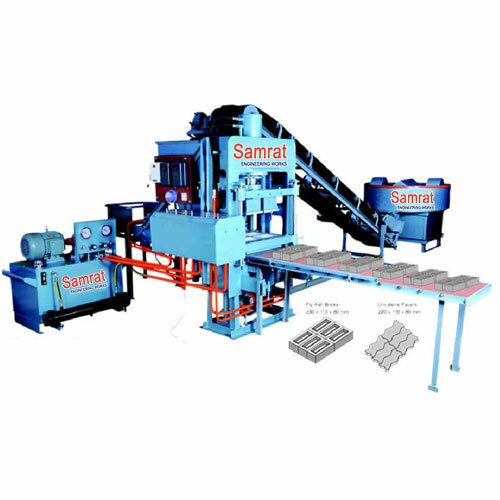 •Facility Materials Manually Single Feeder Facilitates For production of fly ash bricks. •230 x 110 x 80mm 9000pcs. •90 x 90 x 90mm 9000pcs. •Concrete Paver Blocks single layer uni stone 220 x 110 x 100mm 9000 pcs. •Indicative only. Production d e p e n d s upon the labour efficiency and mix quality. •Higher tonnages, brick size as per customer specification. •Specifications are subject to change for improvement. •Specification, weights, volume are approximate only manufactures may introduce such alterations as they may deem fit without previous notice. •Machines can be supplied as per customer's specific requirements. •Machine capacity mentioned is only for guidance.